In cutting mode, AquaCare is used for preparation of cavities without the need for anesthetic or drilling. The AquaCare cuts quickly but conservatively, minimizing the removal of sound tooth material and eliminating the risk of chipping or stress fracturing. Unlike conventional rotary cutting instruments, the AquaCare is not in direct contact with the tooth structure. There is no vibration, heat generation, noise or smell. The AquaCare main feature is the patented handpiece. The handpiece delivers a high-speed fluid stream to create a liquid curtain around the abrasive medium. The fluid is fed from a self contained reservoir within the AquaCare unit. The fluid stream eliminates free borne dust particles and is comfortable for the patient. The handpiece delivers full access in the mouth as it has no cumbersome powder pots attachments. It is light to hold, easy to maneuver and works equally well with cutting and cleaning materials. The main airstream that contains the particles exits the handpiece at around 80 psi. 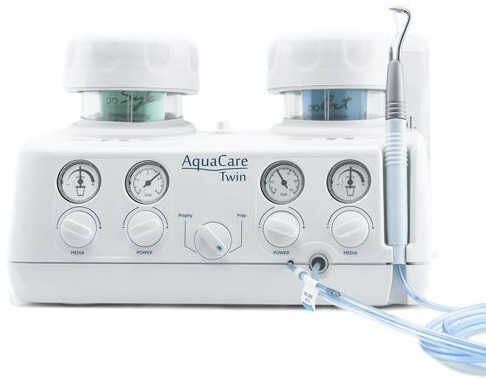 Speed and powder controls on the Aquacare allow the dentist to adjust the pressure and the amount of powder that feeds to the handpiece. The handpiece is autoclavable and comes in two color coded cutting sizes. The long life tungsten carbide cutting nozzles can be easily changed depending on treatment. Cutting Media: 53 and 29 micron aluminum oxide: Powder rate infinitely variable between 0 and 6g/min - 0.2oz via rotating switch and pressure gauge. Handpiece: Anodized aluminum with separate integral powder and fluid channels - both operated by foot control. Nozzles made from stainless steel tube with Tungsten Carbide Tip. Handpieces incorporate quick release system for convenient changeover of cutting sizes. Color coded handpieces for simple tip-size identification. ​Shipping Dimensions: 14" x 14" x 14"